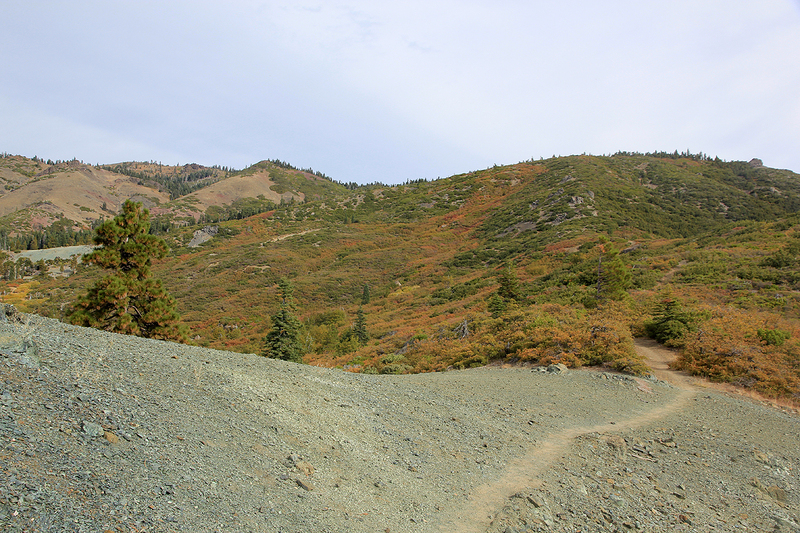 The trailhead for Snow mountain is quite some ways off the beaten track. From the Bay Area, head north on I-80, then I-550, to I-5 and continue north to Maxwell. Take exit 586 and measure from here. Head west following signs for Stonyford, arriving there after driving 30.8 miles. The place has a stop sign near a small convenience store. Turn left here. Already at mile 31.0, one needs to navigate carefully. Two roads fork left, the correct road to take is the second one. It is signed Fouts Springs Road. Continue to mile 37.1, where the road forks. Forest road M5 goes left while forest road M10 forks right. Take the right fork (M10). Contine straight ahead at mile 39.2, at mile 43.7 the pavement ends. You should stay on road M10, this means keeping right at mile 45.2, 50.5, and 52.6. 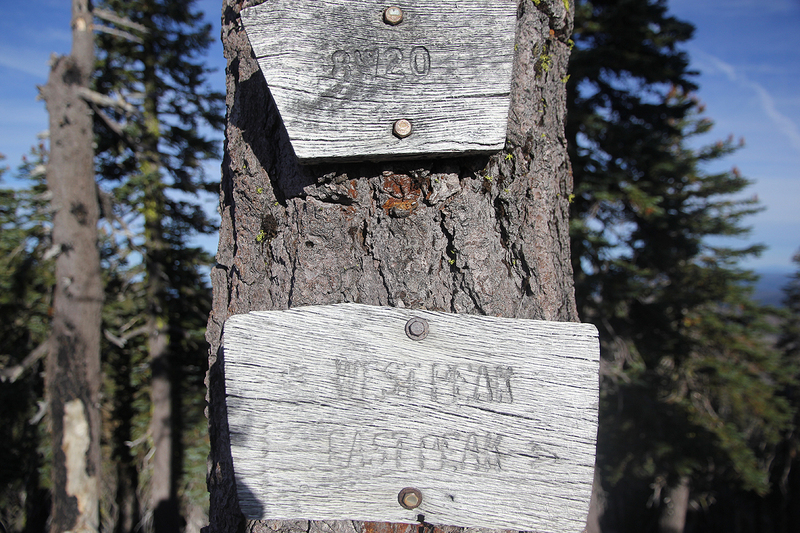 There are some signs saying Summit Springs and/or Summit trailhead, these are both good. At mile 54.4, you arrive at a 5-way forest road intersection. At this point you should leave M10 and head uphill on the road signed for Summit Springs. This road ends with a small loop and parking at mile 56.0. 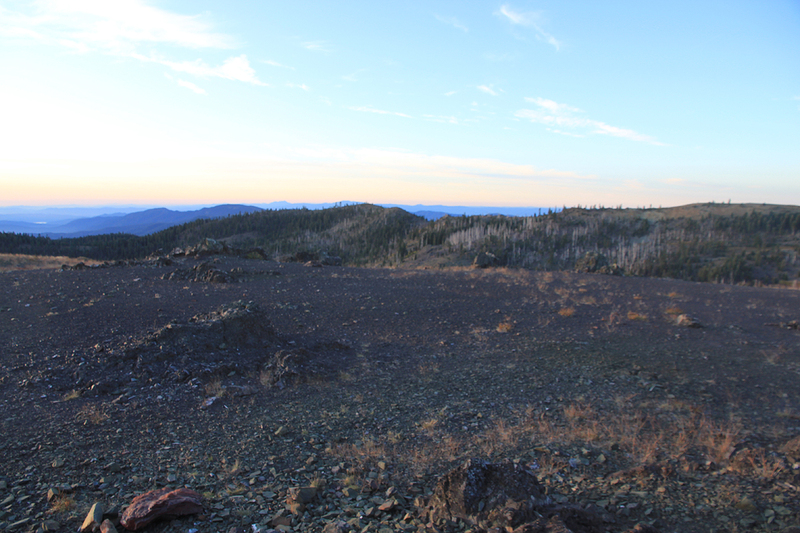 This is the trailhead, location N39:20.749, W122:45.127, elevation 1605 meter. From the trailhead, start out just left of the outhouse, proceed a little downhill, before you locate the trail register where people sign in/out for this hike. Next the trail heads uphill and quickly forks. Either fork is fine, the right fork is likely the shortest path to the location slightly higher up where the two trails merge back together. 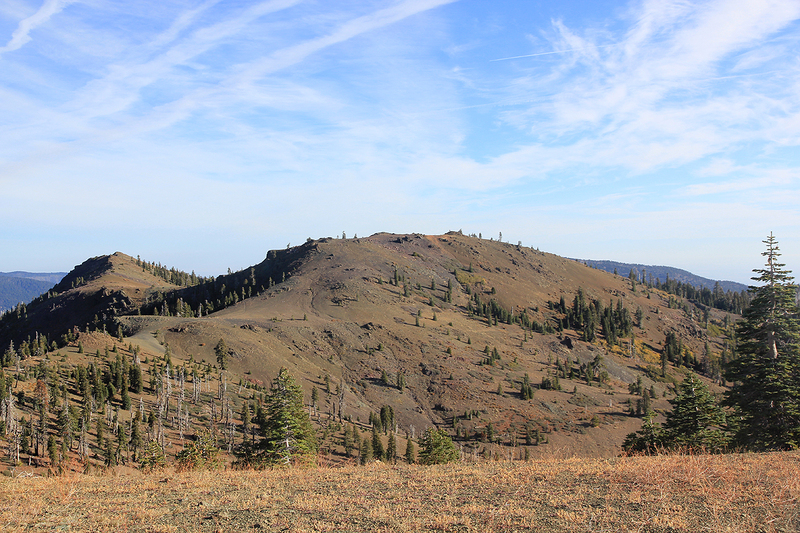 The very nice trail climbs higher, then heading slightly left, zig-zags as it gains elevation before reaching a plateau, Fouts Camp, a pretty nice location for camping. Continue slightly downhill as you arrive at location N39:21.761, W122:44.660, elevation approximately 1915 meter. The trail bends right at this location and enters what looks like a very small valley. A very clear trail will take you uo this small valley and across to fairly level area where the east summit of Snow is ahead while the west summit is up to your left side. 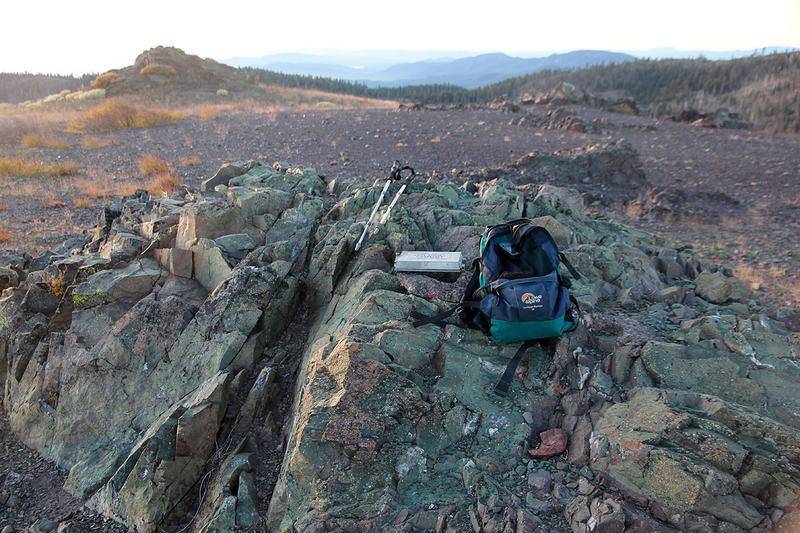 Shortly, the trail forks at location N39:22.355, W122:44.901, elevation 2000 meter. 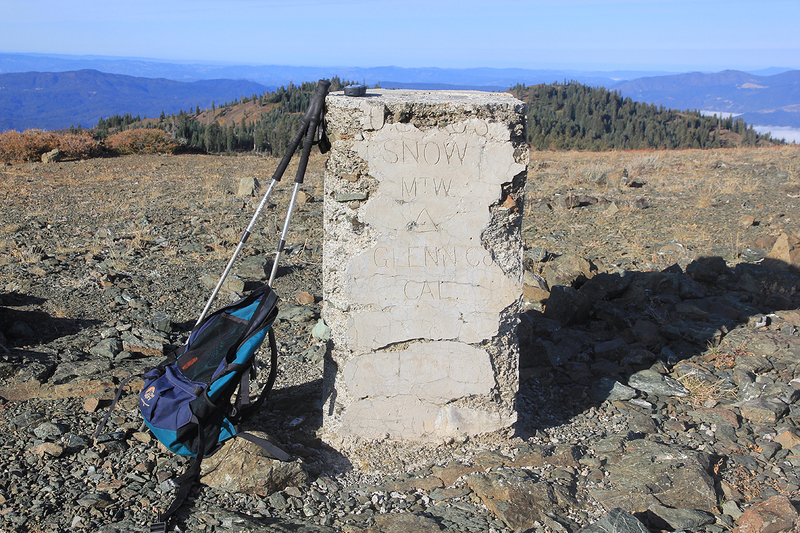 There is an old wooden sign pointing straight ahead, that says Snow Mountain summit, thus stay left at this fork. After crossing the basin, the route climbs to a col on the main ridge, signs here says East summit right and West summit left. From here, a very short uphill will take you to the east summit where a trail register is placed on the leftmost of two similar looking highpoints. 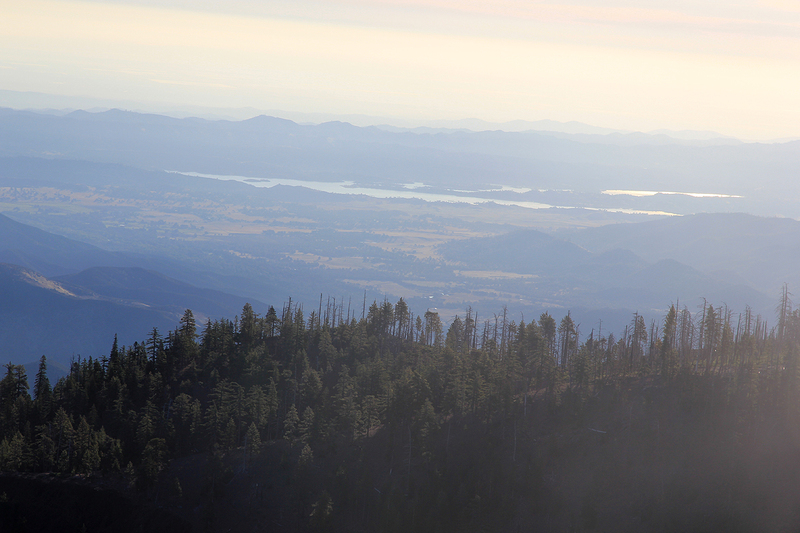 Most of the day had been spent climbing South Yolla Bolly and Black Butte, followed by a nice dinner in Willows. I then set out for the trailhead of Snow Mountain. 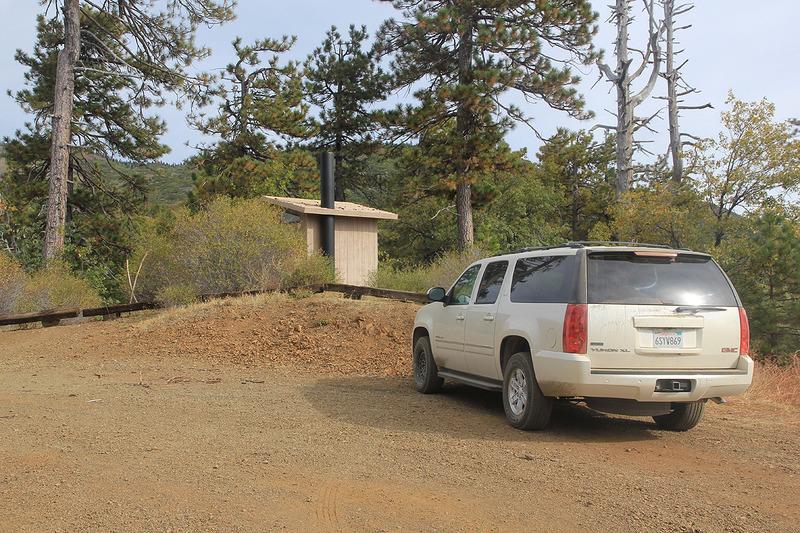 After a pretty long drive in the dark, I arrived at the trailhead around 2000. 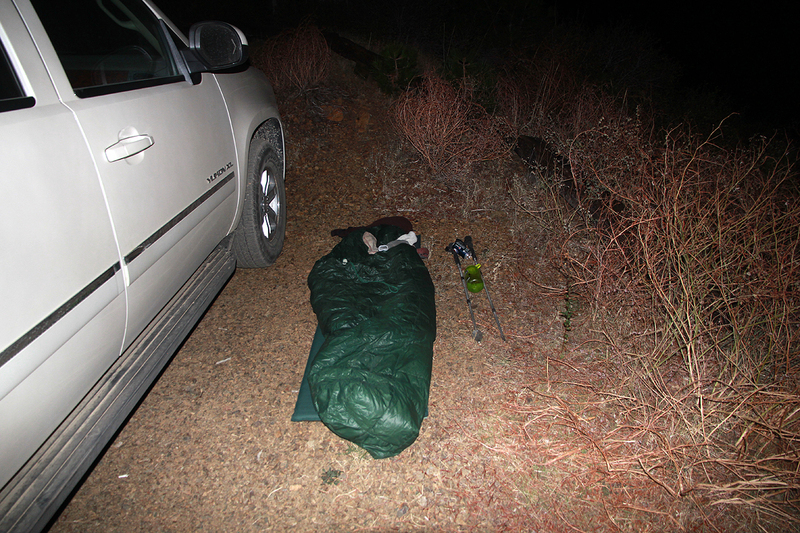 I quickly put out my sleeping bag and laid down to feel the silence and observe the stars. No moon at this time and a brilliant Milky Way. There were more shooting stars and I had a nice evening before falling asleep. I woke up around 0400 with Orion standing big in the sky above me. After more star watching, I left around 0530. The hike was easy and pretty soon I was at Fouts Camp. Slight trouble here, since it was still dark and the trail sort of vanished since people clearly walk all over the place. I did not appreciate the downhill slope, turned back and started going uphill. No trail, but pretty soon I topped out at a small, local top above the camp. From here I could see the contours of the higher west ridge right across. Descending in that direction made me cross the trail where it ascended the small valley between the two hills. As I came to the next trail fork, daylight started to come. 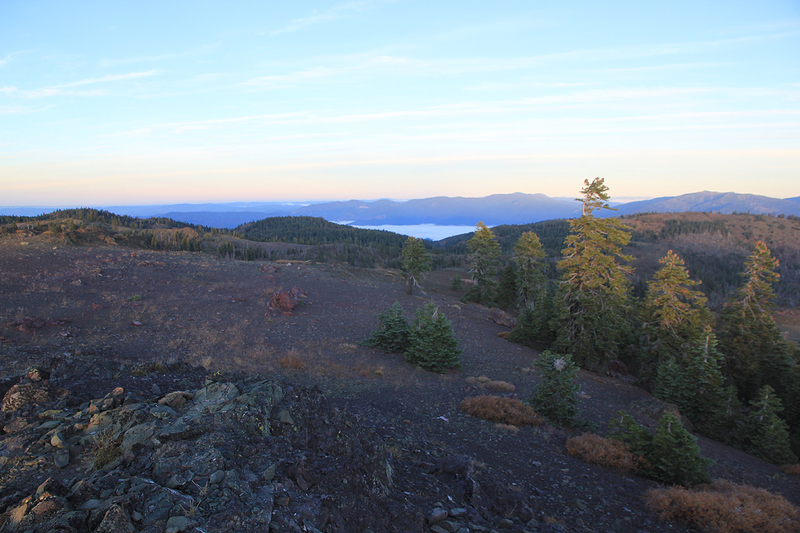 I arrived at the East summit shortly before 0730, ie. about two hours including my small side trip to a local summit. I signed the register and watched the arrival of a new day. Somewhat concerned, I became aware of a pretty dominant summit further north-east. I had not seen any of the signs telling me that I definitely had arrived at the highest summit of Snow Mountain. Still, it looked unlikely that the seemingly equally high peak to the north-east should be the east summit. It looked as if it was separated from me by a pretty deep valley. The day was nice and I decided that I might as well explore the ridge that descended in the direction of this mystery peak. My forest map did not indicate any peak in this direction and that worried me slightly. I started out and walked the ridge system until a point where the slope became much steeper. 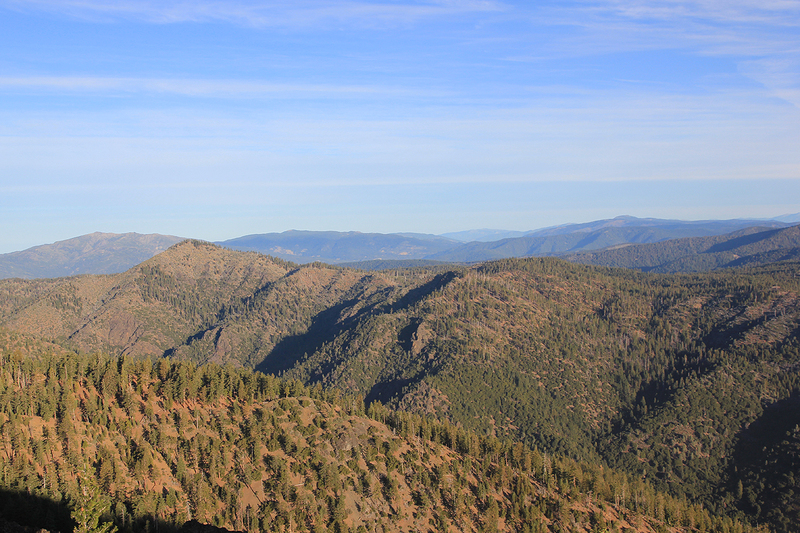 From this view point it was clear that the peak was indeed separated from me by a very significant canyon. No way, that I would try to cross it - it looked like a major undertaking. My GPS also indicated that I was already further from the east peak than the map distance between the two summits and I had descended more than 200 vertical meter. My forest map was good for navigating forest roads, but without any contours not really suitable for hiking. I returned back up to the east summit and descended to the col on the ridge where I now read the signs for the west and east summits poining in opposite directions. Good. (The mountain I had been looking at was Saint John Mountain, 2056 meter.) 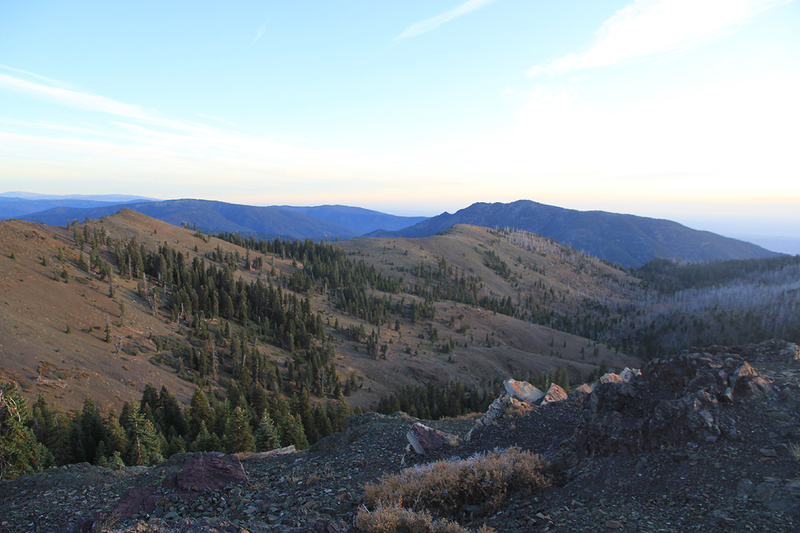 I decided to visit the west summit, then continue the main ridge and descend directly back into the small valley near where I hit the trail before daybreak. This was a nice loop and can absolutely be recommended. 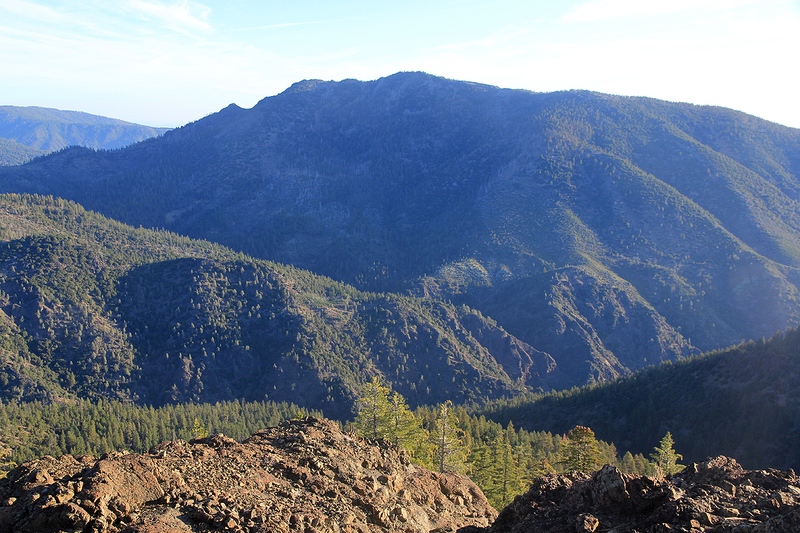 I was back at the trailhead around 1045, a bit more than 5 hours including my long ridge exploration. My plan was now to drive further west, explore a possible route to Hull Mountain and then find Hwy. 101 for my return to the Bay Area. Here is a map with an overview of all my travel in Mendocino on this trip. The East Summit, as seen from the West Summit. Summit view, the west ridge. Summit view, the ridge extending north-east. Summit view, towards the east.